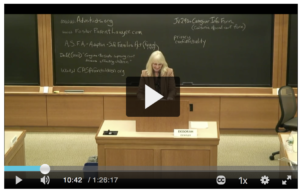 Watch the video recorded lecture “Child Welfare: Foster Care System Reform” by Deborah Dentler on February 8th, 2018. Click on the title for a link to the video and more details. Guest speakers include Deborah Dentler, Attorney, Law Office of Deborah Dentler, Garrett Therolf, Senior Investigative Reporter, University of California, Berkeley Investigative Reporting Program and Common Sense Media, and Mark Hamlin, HLS ’16, Associate Attorney, Baker Botts LLP.